Gurney Slade (Binegar) Former Chapel. Binegar is a small village and civil parish in Somerset, England. 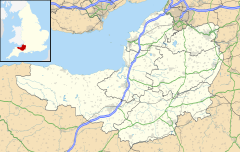 It is located on the A37, 4 miles (6.4 km) east of Wells, between Shepton Mallet and Chilcompton. Its population in 2011 was 313. Binegar and Gurney Slade on the opposite side of the A37 are effectively a single village and share a sign on the main road. In Gurney Slade, the quarry and houses on the north side of Tape Lane are in Binegar parish whilst the south side is in Ashwick parish. In Binegar, some houses on the south side of Station Road are in Ashwick parish and some on the north side of the village are in Emborough parish. The village had one Church of England Voluntary Controlled primary school, which was shut at the end of 2011, one very old church, post office, and smattering of houses. It also has 2 pubs, the Horse & Jockey and The George. It used to have a station on the Somerset and Dorset Joint Railway, which closed in 1966, and was the site of accidents on the line in 1885 and 1886. The name of the village was Begenhangra, in a charter of 1065, which probably meant the slope where beans are grown. It formed part of the endowment of Wells Cathedral. Calamine ore was mined at Merchants Hill in the late 18th century, but the area's principal focus was on limestone quarrying, at Gurney Slade quarry, and agriculture. The parish was part of the hundred of Wells Forum. The village falls within the Non-metropolitan district of Mendip, which was formed on 1 April 1974 under the Local Government Act 1972, having previously been part of Shepton Mallet Rural District, which is responsible for local planning and building control, local roads, council housing, environmental health, markets and fairs, refuse collection and recycling, cemeteries and crematoria, leisure services, parks, and tourism. It is also part of the Wells county constituency represented in the House of Commons of the Parliament of the United Kingdom. It elects one Member of Parliament (MP) by the first past the post system of election, and part of the South West England constituency of the European Parliament which elects seven MEPs using the d'Hondt method of party-list proportional representation. The Norman Church of the Holy Trinity was rebuilt in the 15th century, and again rebuilt (except for the tower) in 1858 for Rev William Heade. The tower contains two bells dating from 1776 and made by William Bilbie of the Bilbie family. It has been designated by English Heritage as a Grade II* listed building. ^ a b "Binegar Parish". Neighbourhood Statistics. Office for National Statistics. Retrieved 1 January 2014. ^ "Two Somerset primary schools to close". BBC. Retrieved 8 August 2017. ^ "Somerset and Dorset Railway — accidents". Kevin Clapcott. Archived from the original on 7 February 2012. Retrieved 29 November 2008. ^ a b Bush, Robin (1994). Somerset: The complete guide. Wimborne, Dorset: Dovecote Press. pp. 36–37. ISBN 1-874336-26-1. ^ "Somerset Hundreds". GENUKI. Retrieved 12 September 2011. ^ "Shepton Mallet RD". A vision of Britain Through Time. University of Portsmouth. Retrieved 4 January 2014. ^ Moore, James; Rice, Roy; Hucker, Ernest (1995). Bilbie and the Chew Valley clock makers. The authors. ISBN 0-9526702-0-8. ^ "Church of the Holy Trinity". Images of England. Retrieved 5 October 2007. Wikimedia Commons has media related to Binegar. This page was last edited on 7 November 2018, at 08:25 (UTC).